The rule of law is compromised when the Romanian justice department overwrites international contracts ratified by the country, Árpád Antal, Sepsiszentgyörgy/Sfântu Gheorghe city mayor commented on the Bucharest Court’s ruling that forces the Brassó/Brașov County Council president to remove the Hungarian text from the exit sign placed at the border with Kovászna/Covasna County. Romania has committed to guaranteeing minority rights, as ratified in the minority framework agreement and the European Charter for Regional or Minority Languages, which overwrite the Romanian legislation, Antal said. If the court rules differently, the rule of law is compromised, he highlighted. According to Antal, if we follow the logic of the Bucharest Municipal Court, the bilingual Sibiu/Hermannstadt (Hungarian: Nagyszeben) city entry and exit signs are illegal, too, although they were installed by the former mayor of the city, currently the president of Romania, Klaus Iohannis. Something similar happened last year in Maros County. The bilingual county exit sign at the border between Maros/Mureș and Fehér/Alba County spurred controversy. It was taken down due to multiple complaints, and then replaced. The bilingual sign was finally removed in March last year by the traffic patrol. The goal should be to have the European Union deal with minority rights so similar situations are avoided, Antal said. The Democratic Alliance of Hungarians in Romania’s (RMDSZ) Minority SafePack program and the Szekler National Council’s (SZNT) European Citizens’ initiative for the equality of the regions and sustainability of the regional cultures open closed doors and made the minority rights question a topic for discussion. 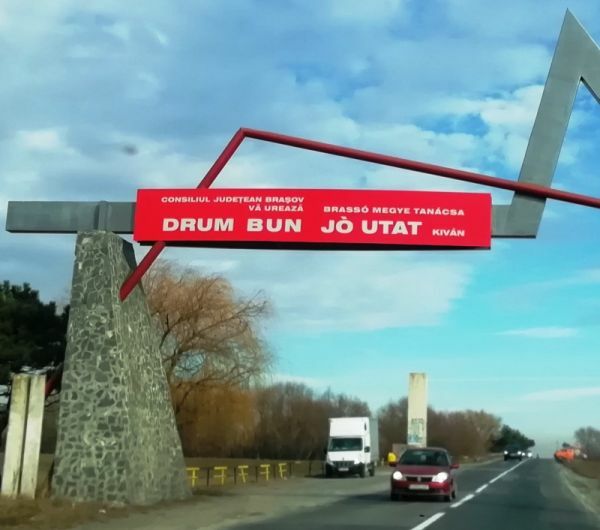 The Bucharest Court has ruled in favor of the Dan Tănasă-lead Asociația Civică pentru Demnitate în Europa (ADEC), forcing Adrian Veștea, president of Brassó/Brașov County Council, to remove the Hungarian text from the county exit signs placed at the county border with Kovászna/Covasna County. The ruling is not final, and the Brassó/Brașov local government will appeal the decision as soon as it has received the explanatory memorandum from the Bucharest Court.